The oldest crit in the west (or, how I re-learned to stop worrying and love the prime lens). Sunday is becoming adventure day. To quote Harry Dean Stanton, ‘Together they turned everything into a kind of adventure and she liked that. Just an ordinary trip down to the grocery store was full of adventure’, And here, to me, us, c’est le meme. 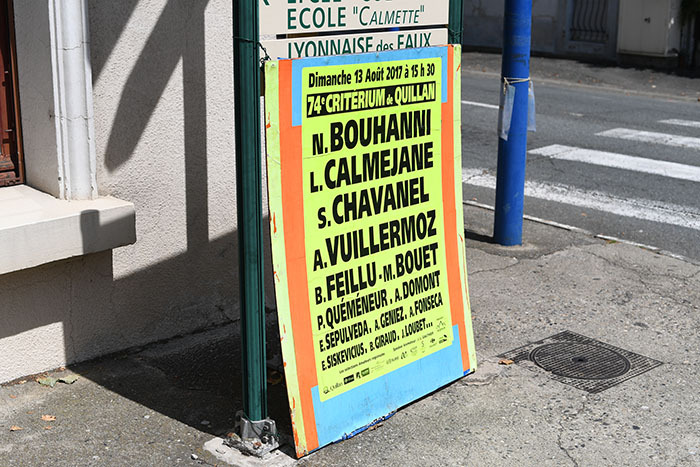 Last Sunday our little Pyrenean day trip was interrupted by a flouro sign adorning familiar names…Bouhanni, Chavanel, Bouet. 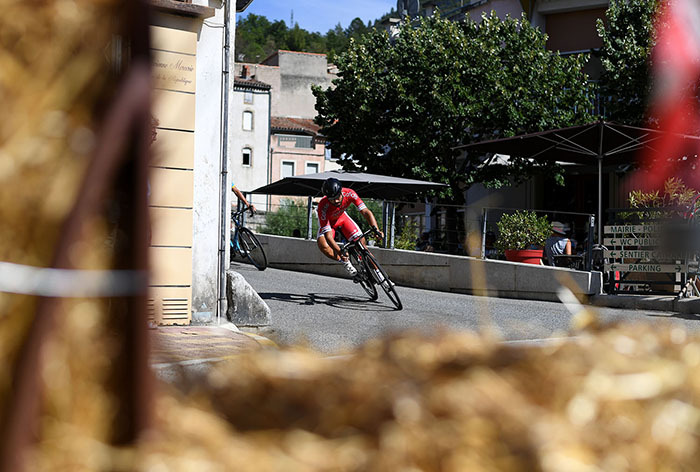 I knew Quillan was a cycling town, but in a few hours the oldest crit in France was rolling out with it’s usual smattering of Pros wanting to add their names to the cup in the unlikeliest of Sunday afternoon corners of my manor. 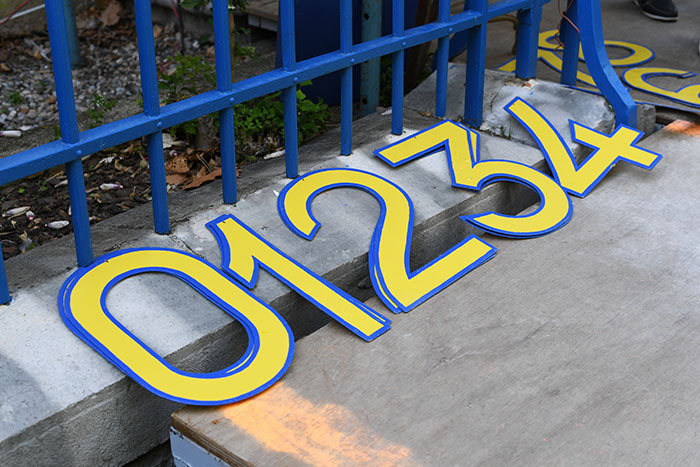 And it’s a decent tally of names too. 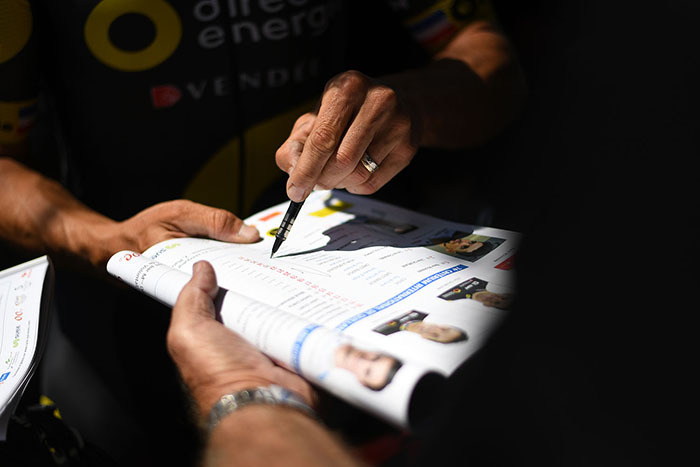 Poulidor, Janssen, Zoetemelk, Anquetil, Chiapucci, Rominger, Mottet, Delgardo, Voekler, Sastre, Rodriguez, have all won it, but so many other names have had a go too…Hinault, Thebernet, Fignon and Jalabert, the list goes on. 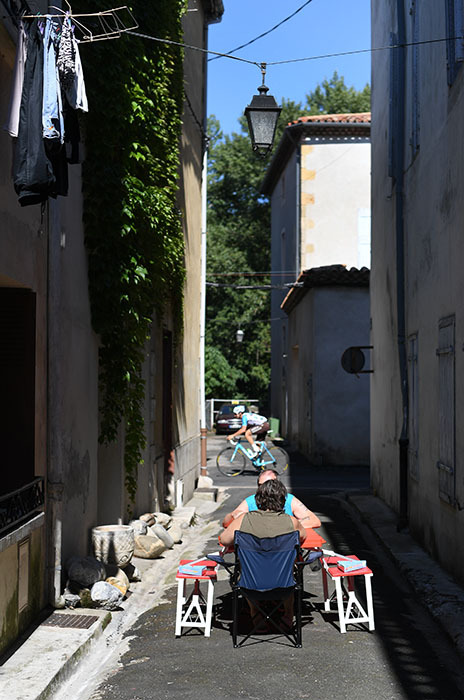 A couple of hours wandering around while they were setting up and talking to neighbours lining up their camp chairs and coolboxes on the street below washing lines paints a picture of a race with a local pride of place, but a down to earth one in this small out of the way town under the shadow of the Pyrenees. 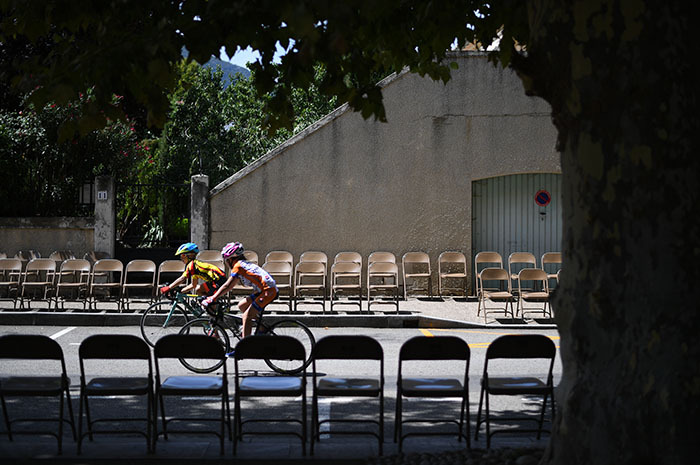 There’s a kind of subtle charm to a scene of mis matched chairs and old tour jersey cardboard cut outs being wheeled out for a little local cycle club race that just happens to draw big names and champions without any of the fanfair of a grand tour stage. 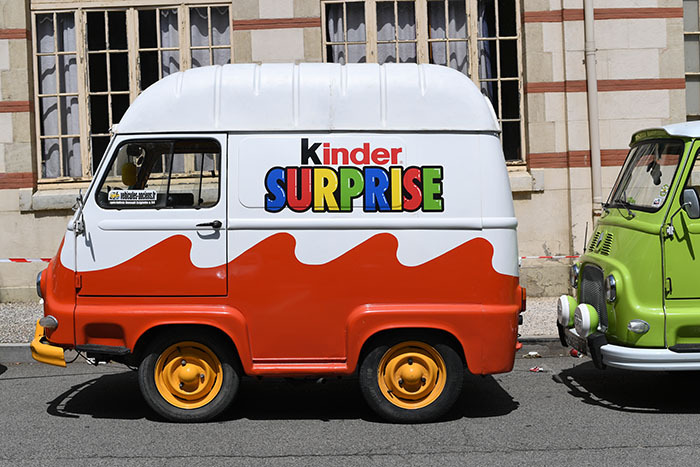 There aren’t any team buses or press or massage or sponsors, the caravan is made up of a shortened home made Kinder egg car and a local’s restored 70’s Renault flat bed truck, presumably polished up for such occasions, and two sets of grandparents and kids chucking penny chews and lollipops out of a Carrefore carrier bag for a couple of laps at eager if slightly bemused tourists caught up in it all and kids told of such history by their elders but mainly just wanting a taste of it first hand. 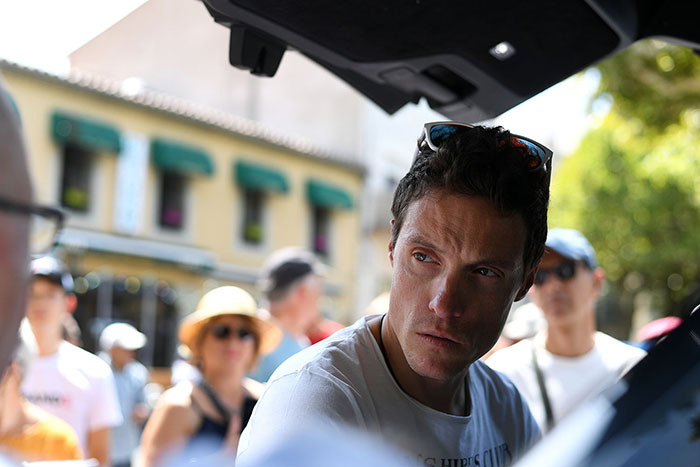 A Range Rover rolls up with a Direct Energy BH on the back and Chavanel’s here. 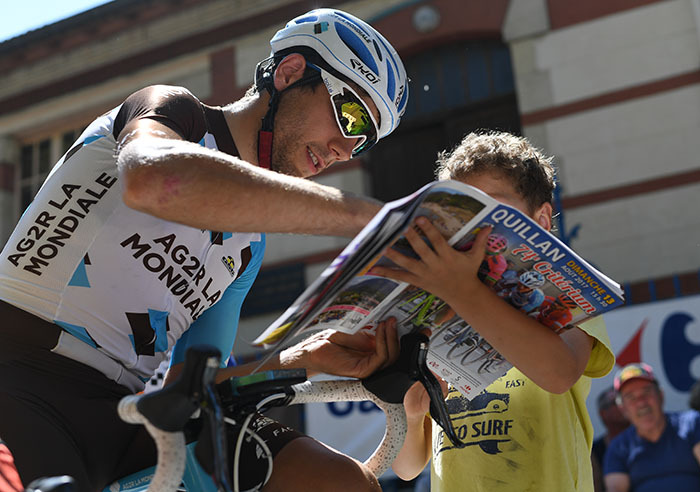 Mobbed by generations small and old all holding out their programmes open at the blank page for hero scrawls, he obliges, as do his team mates and fast changing AG2R riders Vuilermoz and Domont. 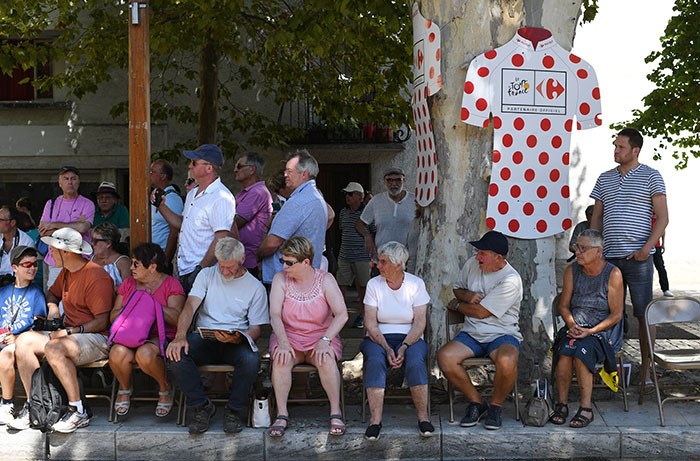 National champion Bouhanni raises the stakes and the entourage of little people caught up in the fervour presumably not often felt among these dappled shadows. 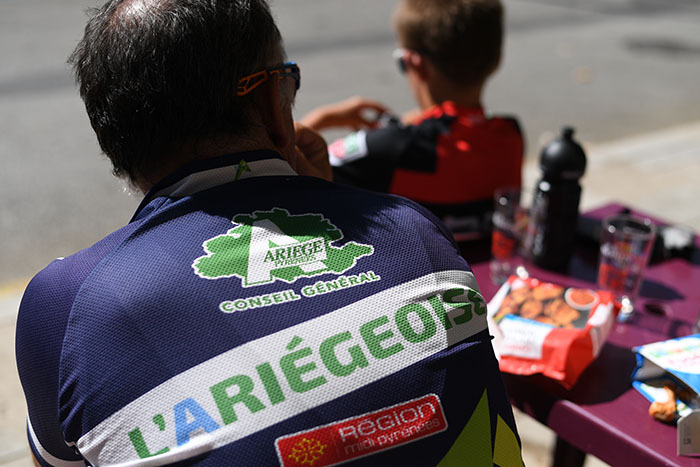 I see a couple of kids, maybe young teenagers kitted up in local team garb, all gaudy with mismatched colours and logos and wonder whether we’ll see them rolling along looking after the next but one generation of contenders up in those mountains somewhere in a few years. 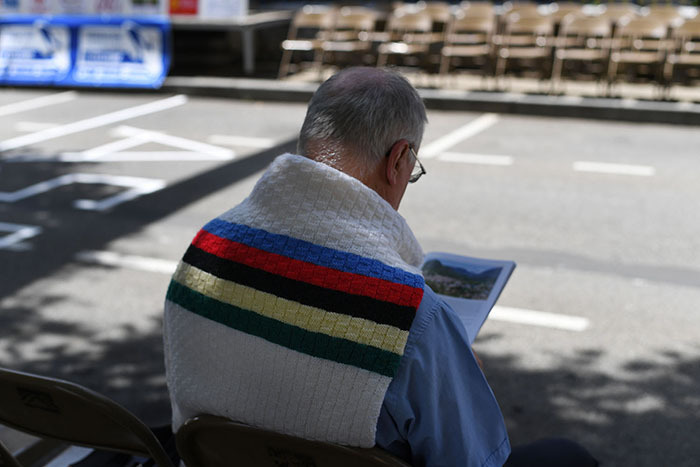 A club member still in uniform and compression socks sits guard of the freshly laid out chairs near the finish line. Opposite and along a bit a lone world champion jumper flicks through the programme. No hurry. 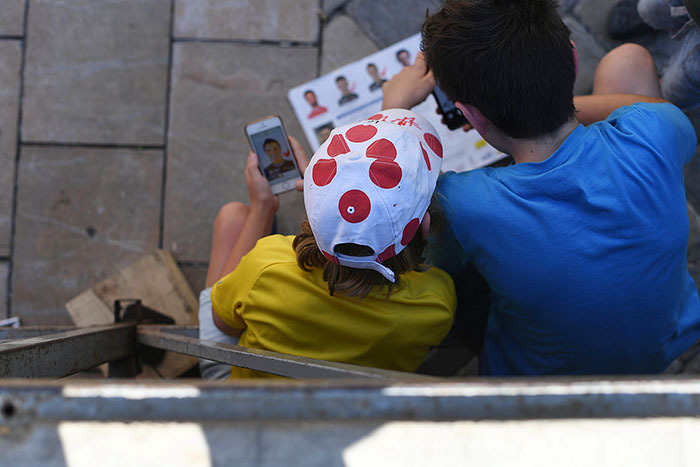 Waiting and watching as the children’s race pushes for finish line glory and parental approval from the stand. I’m not one of those people that always has a camera on them. This is probably daft and has definitely resulted in missed earnings in the salad days of celebrity nonsense, but recently I have taken to going back to the roots of learning and just wandering around with a cheap 50mm lens and revelling in the simplicity of having little choice. I know prime lenses are all the rage again these days, but trend aside there is just a humble honesty to a fixed lens. More than that, there’s a relief from expectation and a hightened sense of being an observer with far less control over what you can record. 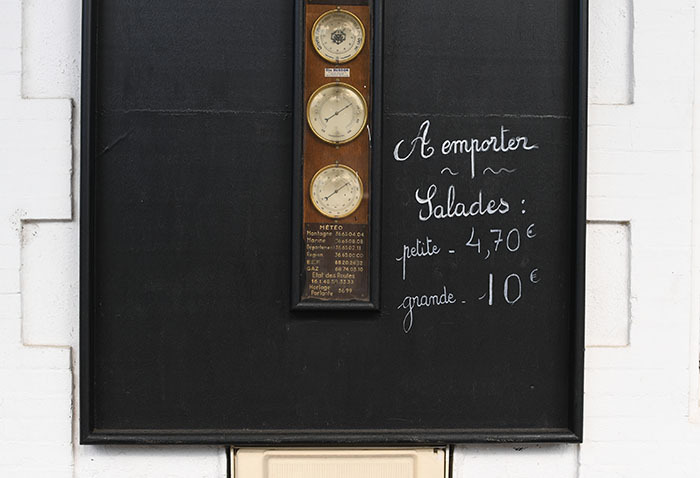 That simplicity and freedom lends itself well to a renewed way of seeing if you want it to. Flashback to the learning years. To the excitement of this magic process. To the fun. 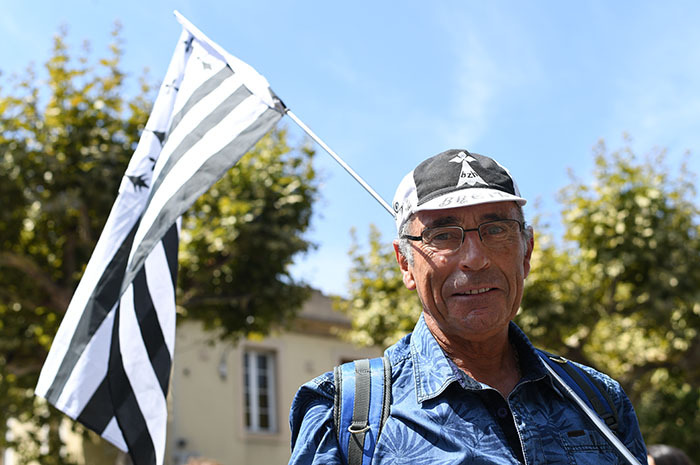 A bloke with a warm energy and a Breton flag stops me and asks where my pictures will end up. 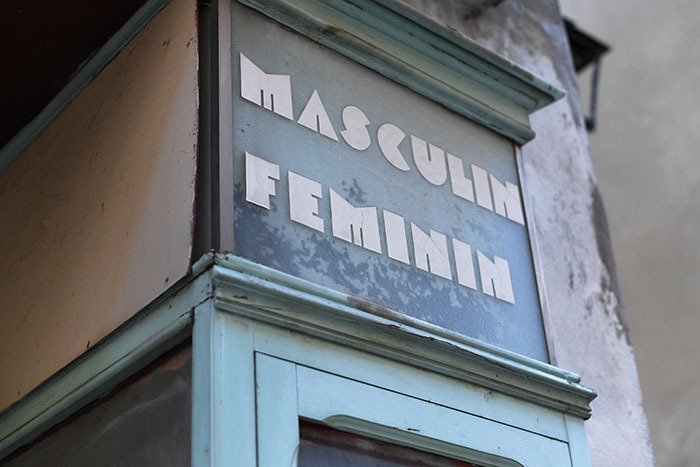 My understanding of French is enough to grasp that but not quite what he goes off energetically about afterwards. 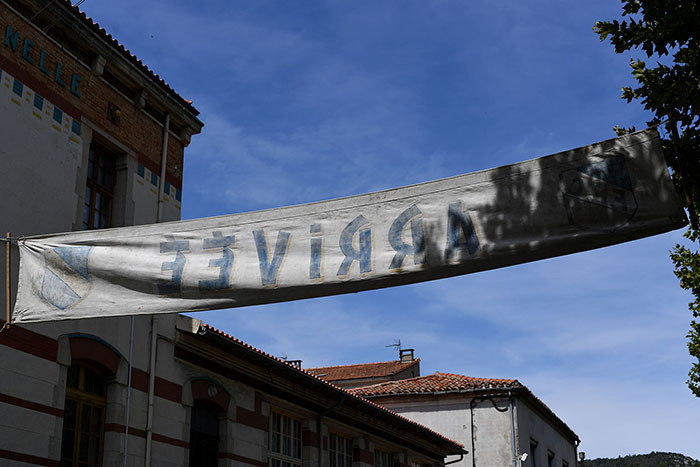 I think I get the grasp that Bernard Hinault is his mate and he flies the flag here for their respected region up north just as he did when Hinault raced these streets. I think that was it, if not I think I’ll remember it as that anyway, it seems right somehow. 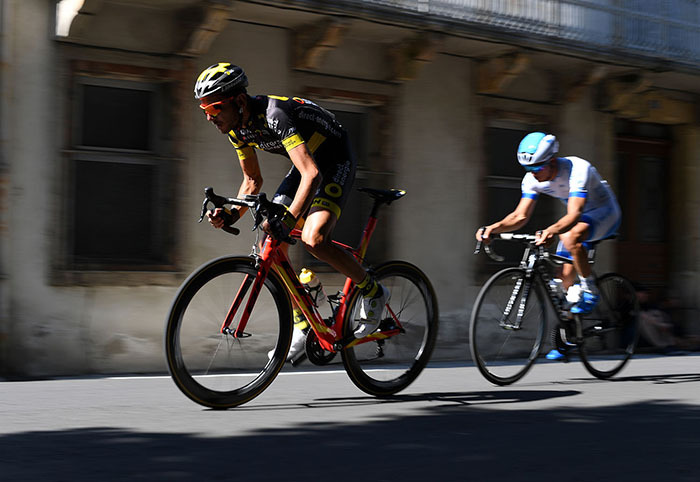 This is the 74th Quillan Criterium, that has run with the exception of the second world war without interruption since 1938 in this little town centre in the south west of France. 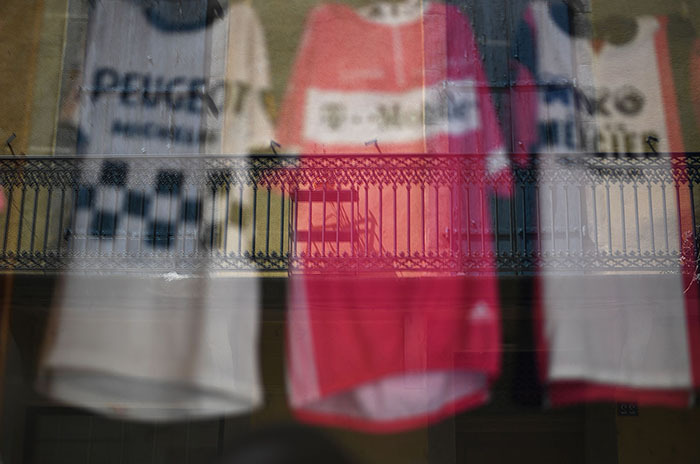 I’ve been here a few times and always felt the cycling presence on these streets, old posters and banners knocking about in former shop windows, the cups and team jerseys of old just left on display for the odd tourist to pick up on. 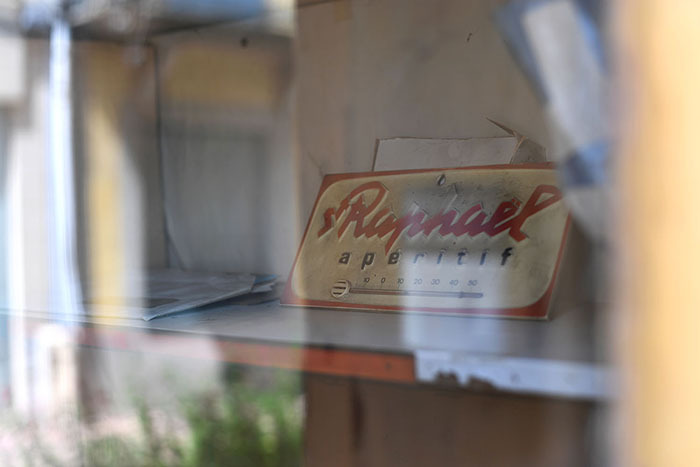 I seem to remember one year a tour stage departing here and not being able to park, let alone get any supper for the team trucks and buses dotted around every possible free bit of pavement. It all kicks off quite subtly really, a sedate prelude to a rolling start and an uptempo baseline or the next couple of hours. Le Mans like, it catches the attention and drifts into the background in waves allowing race face concentration and coffee break and toilet break alike with no real affect of the enjoyment of the spectacle. This less noisy version of La Sarthe, sees this lot power their way around in laps of the centre ville, local hard nuts just chuffed to be holding the wheel of someone with a higher calling. 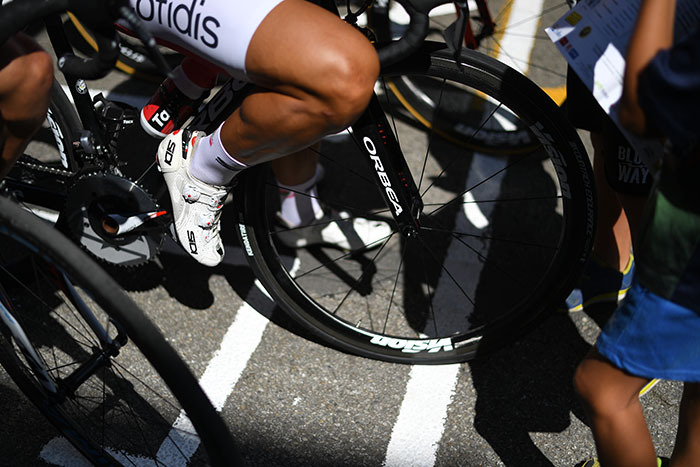 Gaps break and close, bystanders wander, Belgians drink beers in the sun. 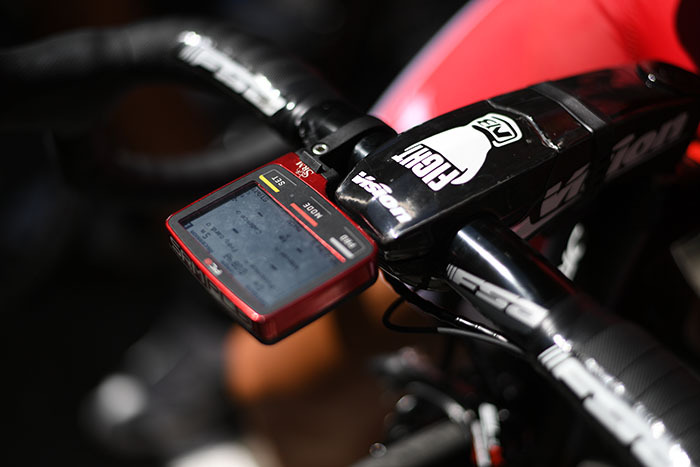 I overhear English, swearing about Froome, about Sky, about Valverde. Out there are contenders oblivious. I am with them. Occasional pop songs signal tannoy pee breaks. Silent but for isolated groups of clapping the showmen whizz between the tree lined streets, closed for the afternoon empowering local club members to guard the baracades smilingly selling tickets for their annual circus they’re obviously proud of. Resigned to an afternoon with no escape by car, late lunches are eaten in the confines of temporarily cordoned off streets. Blissfully ignorant of the importance to some of what goes on behind them, happy enough to live and let live and put up with lunch on a plastic picnic table instead of round a friend’s in a neighbouring village as hoped. We stroll in and out of viewpoints, climb onto stages being set up for an evening’s entertainment at the village repas. Kids below compare heroes on paper, getting animated when they magically briefly re-appear in person every couple of minutes. People watching people watching satisfies and reminds why this sport is different to so many. Our gladiators right here in person, nothing between them and us but the pluck of going up and asking. We depart this spectacle before we want but there are hot tired, patient paws that will melt soon without a river swim and some mountain air as was promised. Atop that mountain, a couple of valleys away the internet announces our winner. 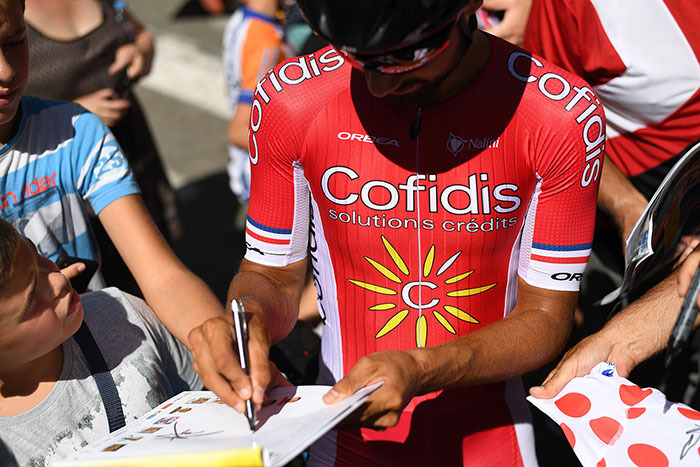 Bouhanni puts his name on that list. 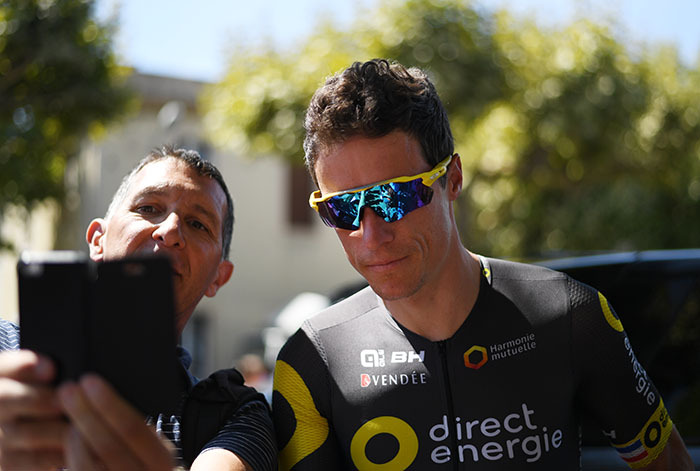 The French have their champion, Quillan shares him for a year. 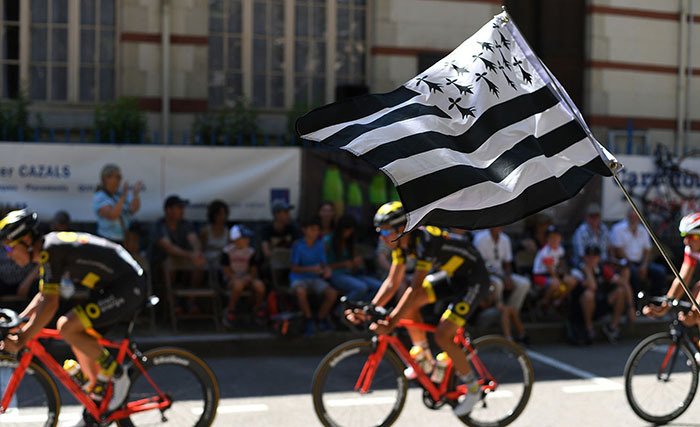 The Breton flag walks home to be packed away for another time. I will see it again here. Comments Off on The oldest crit in the west (or, how I re-learned to stop worrying and love the prime lens). A special little corner of a big dirty wonderful city.